Steers were required to be on the farm by December 31, 2018, to be eligible for show. All other species (lambs, goats, and hogs) must be owned and on the farm by March 1, 2019. Every participant must complete and return a registration form to their local extension office by February 28, stating the exhibitor’s name, age, contact phone number, and physical address of where the animal is located to be eligible to compete in official judging. All participants with a parent/guardian must attend a mandatory livestock show meeting to be held in each of the five (5) participating counties (Camden, Currituck, Gates, Pasquotank, and Perquimans). 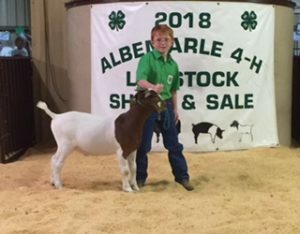 If a youth participant and parent/guardian do not attend, the youth will not be allowed to participate in the 2019 Albemarle Area 4-H Livestock Show and Sale. Should the date for your county’s meeting not fit your schedule, the child and parent/guardian can attend one of the other four (4) county meetings. Please make sure that you sign in at whatever county meeting you attend so that you will receive credit for your attendance. Perquimans County – Wednesday, January 23, 2019, at the N.C. Cooperative Extension of Perquimans County office beginning at 6 p.m.
Camden County – Tuesday, January 29, 2019, at the Camden County Senior Center beginning at 6 p.m.
Gates County – Thursday, January 31, 2019, at the N.C. Cooperative Extension of Gates County office beginning at 6 p.m.
Currituck County – Friday, February 8th, 2019, at the N.C. 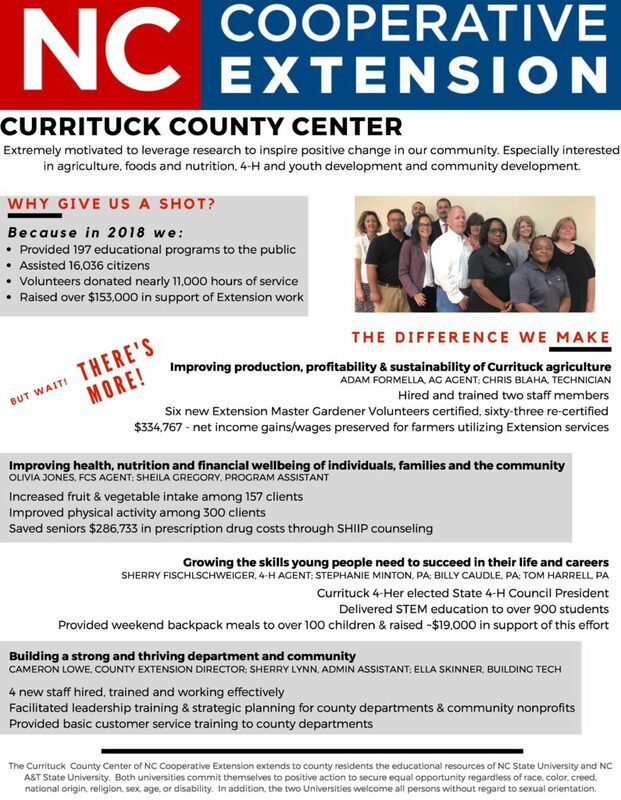 Cooperative Extension of Currituck County office beginning at 6 p.m.
Pasquotank County – Tuesday, February 19, 2019, at the N.C. Cooperative Extension of Pasquotank County office beginning at 6 p.m.
All forms needed to participate in the 2019 show will be available at each of these meetings. At these meetings, N.C. Cooperative Extension staff will go over basic information regarding your animal, along with the updated rules, forms, schedule of events, project books, and other aspects involved. These meetings are critical and mandatory for everyone, regardless of you being a veteran exhibitor or new to the Albemarle Area 4-H Livestock Show and Sale. So mark your calendars and make plans to attend one of these meetings. If you have any questions concerning the meetings or in regards to your animals, we are always available to help in any way we can. Please do not hesitate to contact us at 232-2262. Thank you and we all look forward to a fun and fantastic 2018 Albemarle Area 4-H Livestock Show!